Aly Childs holds a sign that reads "The future is us. The future is bright." 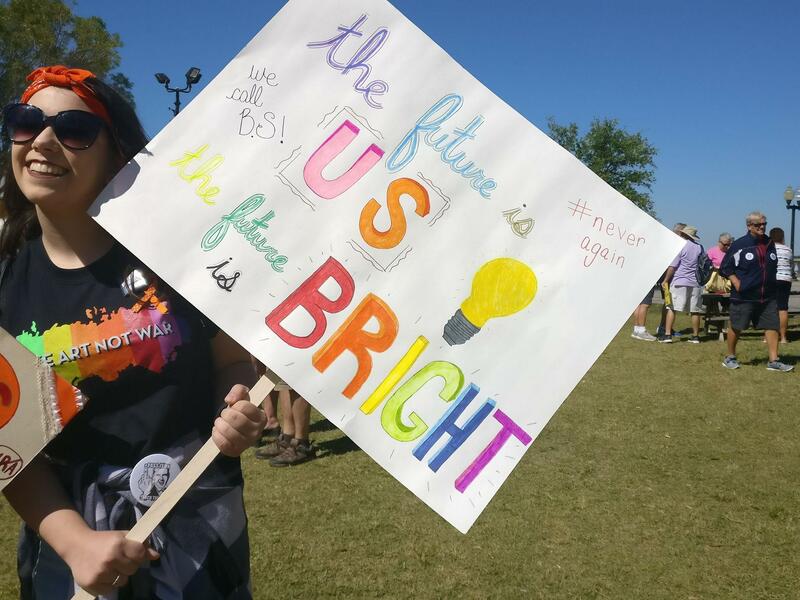 at the Fort Myers March For Our Lives on Saturday, March 24. One of the many marches held over the weekend attracted 2,000 participants in Fort Myers, including two best friends. The Thursday night before the march, high school seniors Aly Childs and her best friend, Christina Rossomando, made signs for the March For Our Lives rally in Fort Myers. Aly’s said, "The future is us. The future is bright." The morning of the march, they got ready to head downtown amid speculation about how many people would be there. The girls went back and forth looking at the estimated numbers on Facebook and across social media. "Like, 2,500 people," Christina eventually said. There was also giddy anticipation about being part of something so big. 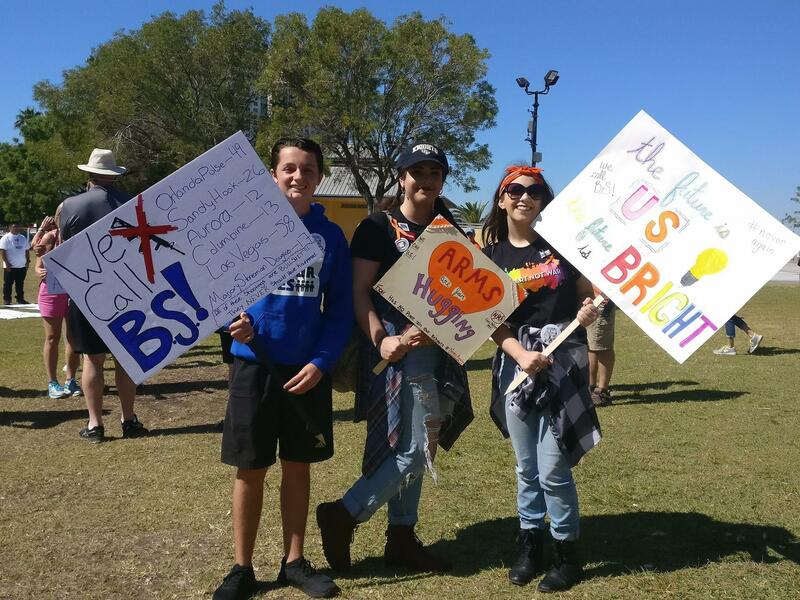 (From Right) Aly Childs and Christina Rossomando hold handmade signs alongside their friend Donovan Souppa. They headed downtown where they met up with Carling Witt, who organized the march, and immediately, Aly and Christina were surprised at not only the number of people but also the different groups represented there. “There’s a huge range of people,” Aly said. “Yeah, all ages,” Christina added. The two began helping by selling ribbons. The proceeds of the sales would go toward the March For Our Lives foundation. One woman they approached with their ribbons asked the girls if they were registered to vote. The answer was yes. "Eleven days until I can vote," 17-year-old Aly told her. "So, you guys can vote in November," the woman replied. After they helped with setup, Aly and Christina joined the chants that broke out while speakers took the stage to begin the rally. And, then, as the march began, Aly and Christina found out they’d be leading. As they led the group to the Lee County Courthouse where students spoke, more chants filled the air. It was there where the Fort Myers March For Our Lives organizer Carling Witt took the stage to recall how she felt when she was downtown during the Zombiecon shooting — just a few blocks and two and a half years from this rally. “And, I’m sitting there; I was there touching a wound on my head where a police officer threw me into a wall to try to get me out of the way of the bullets," Witt said. "And, I kept on touching it, and I kept on saying, ‘That could have been a bullet. I could’ve been dead right now.'" One counter protester held a flag that said, "Don’t tread on me," and he argued with some of the marchers. 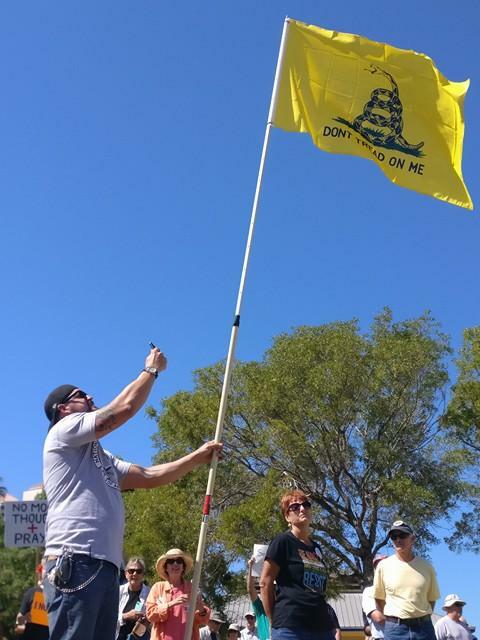 Counter protester Gary Snow wears a National Rifle Association shirt and carries a Don't Tread on Me flag. Aly said her mom supported her being there. But, it’s a complicated issue, and there are not easy answers. Her best friend Christina agreed. Still, Christina said, it’s the beginning of a conversation. After the mass shooting in a Broward County high school that killed 17 children and adults, marches across the country have been organized to “stand up for fallen children due to senseless gun violence.” The events are all scheduled for March 24 to support the main March For Our Lives happening in Washington DC. There's also a planned march in downtown Fort Myers.